Craft Hope Project 11: Nashville! Last year I wanted to participate in some of Craft Hope's projects and never got it together in time. When they announced Project 11, putting together birthing kits for Konbit Sante, I knew I had to commit! I'd seen several documentaries about Haiti in the weeks prior, and really felt a tug on my heart to help the people there. Not knowing what the response would be, I posted the Project 11 information on my Facebook page and asked if anyone was interested in putting a group together. Friends invited friends until we had a great group of women assembled! The project asked for three handmade items in addition to the birthing kits: handmade tote bags, swaddling blankets and small softies. 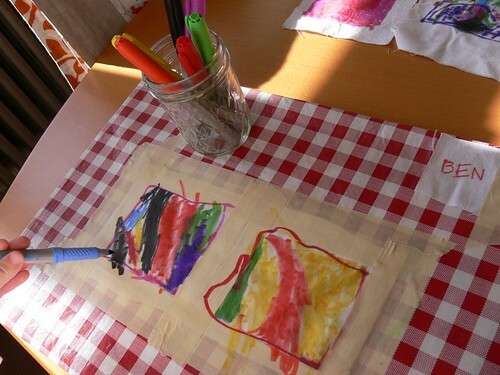 A member of the Nashville group, Rowena, immediately came up with a great tutorial for the tote bags! (See here.) We all committed to making a certain number of each item, started gathering supplies and exchanging patterns, and got to work sewing! First I'll show you the softies. I think it warrants mentioning that the women that made these had very little sewing experience, the first batch was made by my sister Carol (HI!) 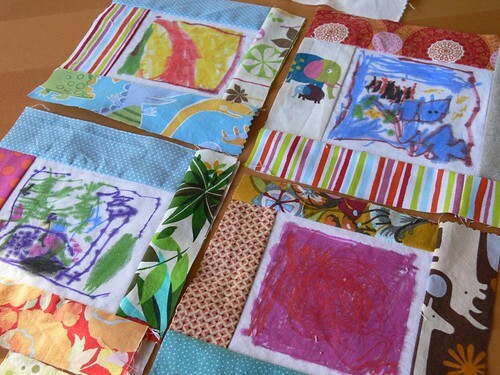 on her brand new sewing machine, the second batch was handsewn by a new friend that mostly does collage work in her crafty time, and the third batch was made by a novice sewer as well, using recycled materials! I think they turned out great. 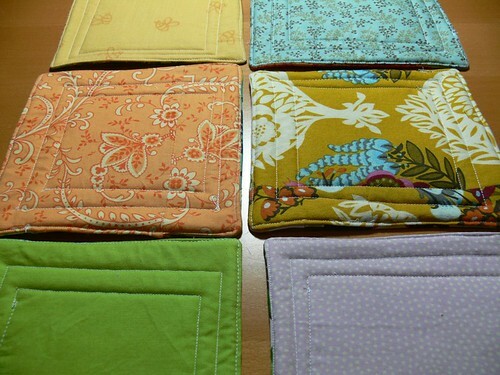 We received about 35 blankets, some made from flannel sheets, some appliqued with hearts, some with very cute prints. And I think the bags are best shown in this photo, aren't they beautiful? The contents of the kits are beyond humbling, even homebirth supply kits have many, many more items than what these Ziploc bags contain: plastic sheeting, small bar of soap, an alcohol wipe, a small packet of Purell, cotton string, latex gloves and a razor. 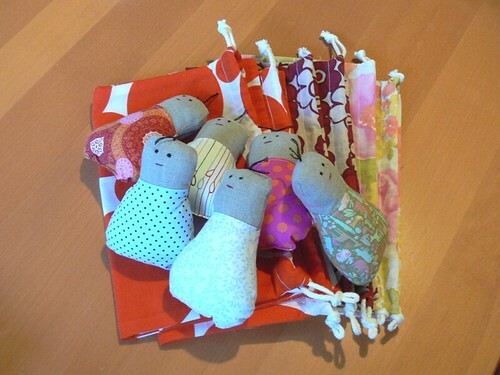 Craft Hope added a wonderful, handmade element to these kits by asking people to make the bags, blankets and softies to go along with this very, very basic supply kit. I am SO proud of what our group accomplished. Along the way I heard some apologies for "not doing enough", but the amazing part of this project is that without the efforts of everyone, no matter how small, we would have had one less blanket, one less softie, one less Ziploc bag to send. It all makes a difference! Angel, this all looks so great!! The softies, the blankets and the bags all look beautiful! Having just given birth less than 3 months ago, it is indeed astounding and humbling for me to think of so many women around the world who give birth with the very bare minimum -- and sometimes not even that. I am so happy I decided to participate in this project, via Seattle. The thought of providing some handmade goodness to help welcome these sweet babies... You should be receiving today or tomorrow 6 drawstring bags and 6 softies. Hopefully just in the nick of time to make the Craft Hope deadline! 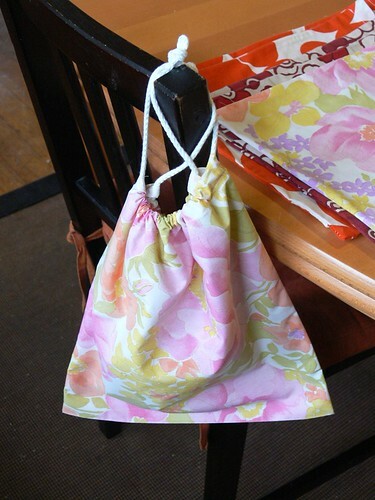 I made the drawstring bags following Rowena's fab tutorial and using pillowcases. 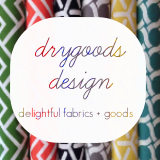 I often buy cute pillowcases when I see them, they make great material for different kinds of projects. This was one! One pillowcase was exactly enough fabric for two drawstring bags. 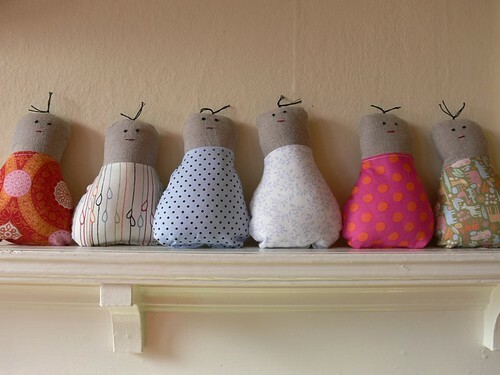 I also made 6 little softies about which I will post a tutorial next week. I know it's not much, and I wish I had had time to make much more, but hopefully it will allow you to complete a few more bags. Yay for getting this done! The stack of bags on your windowsill is impressive and I'm getting all emotional hoping they will each help a mama-to-be in need. I cannot believe it's almost Friday already. Where has this week gone? I've been so sleep-deprived (and so distracted by the awesome Millennium Trilogy...) that I haven't registered the passing of the days. But, we've had a little bit of snow this week and a whole lot of fun with snow balls. Boy, how nice it is not to be hugely pregnant for this round of snow flakes! Anyway, here I am babbling again. How 'bout I share some links? - Beautiful oil cloth placemat by Wren Handmade via The Purl Bee. I am so making something like this when Henry starts eating solids! - I have been living vicariously through Design Mom who just moved her whole family to France! Brings back so many memories of my childhood and adolescence! The hubby and I frequently think about doing something similar some day. - I love this Monster Tooth Pillow by The Long Thread via MADE. Ben has been obsessed with losing teeth for over a year now. The first lost tooth is most likely still a good couple of years off, but I'd better be ready for that big event! 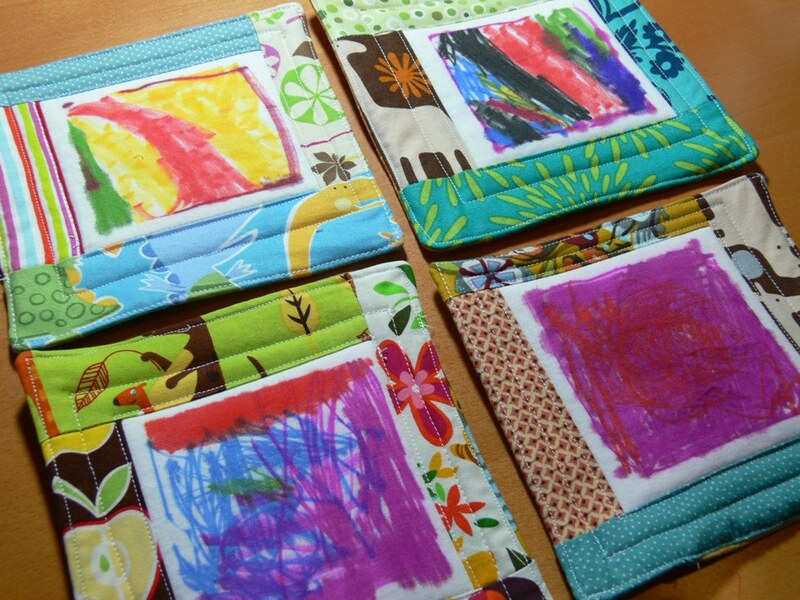 - Another fab tutorial via Made by Rae is this Play Mat / Messenger Bag by Ginger Cakes. Wow! 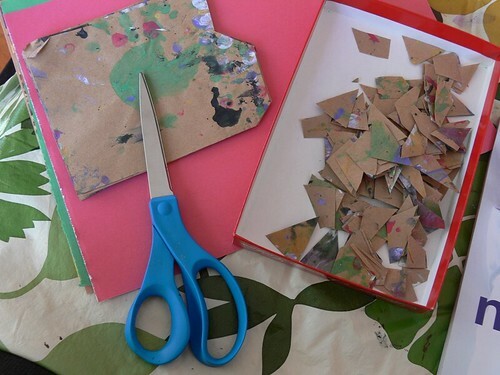 Check out the Made by Rae post for tons of ideas for "Boys on the go!". - I can't wait to see this new line out, Storyboek by Jan-Cyn for Birch Fabrics (via A Sewing Journal), wouldn't it make a super cute baby quilt? - Speaking of quilts, I really like this quilt top by Bloom. 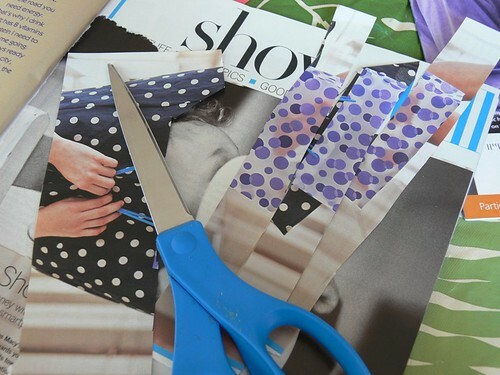 What a great way to feature large scraps of cool fabrics! And that'll do it because I now have a very cranky baby on my lap. Gotta go!! So, this weekend is the Great Backyard Bird Count (it's not too late to participate!) 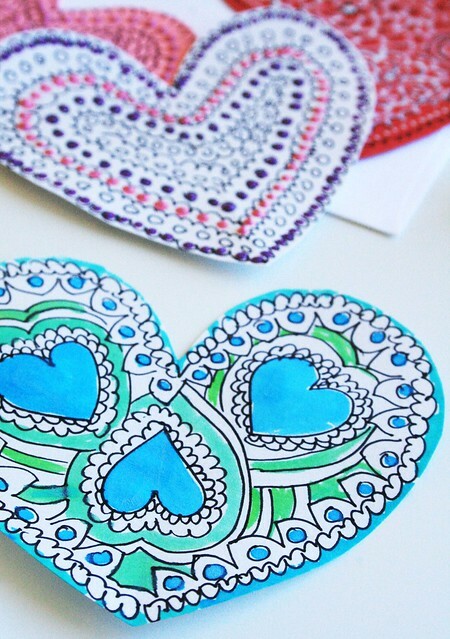 and I thought I'd gather some bird themed craft links together in today's post! Ian and I are planning to participate in the count this weekend, I have my checklist printed off and we'll spend some time looking up some of the birds listed so that we can correctly identify and count them. Crafty Crow has two round-ups: Feeding Wild Birds and Crafting Theme: Birds. Paint Cut Paste made a birdhouse. I mentioned the other day that I've been looking for projects that keep Ben and me busy for a few days' worth of activity this winter, and here's another one. I forget how exactly I came up with the idea of a mug rug involving a hand drawn panel by Ben. 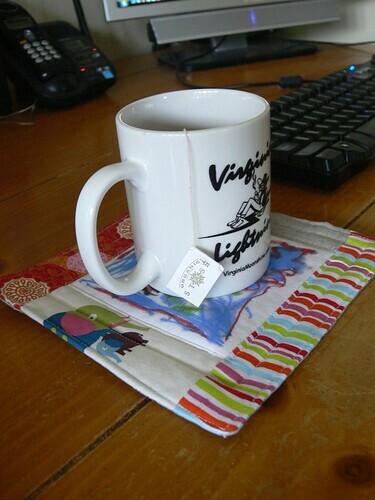 I'd been wanting to use fabric scraps to make mug rugs (aka coasters for your coffee or tea), a fun quick-and-easy project to get back in tune with my sewing machine. 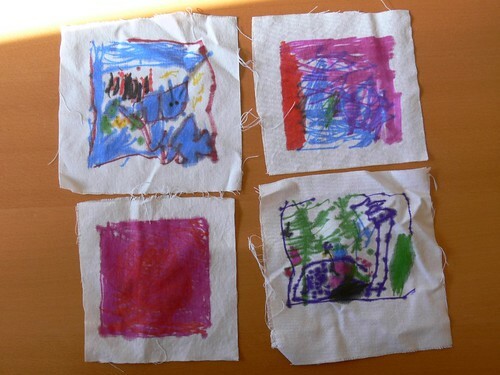 I'm thinking the inclusion of a drawing on fabric was probably inspired by SouleMama's books. To entice Ben to participate, I told him these would be gifts for whomever he chose. 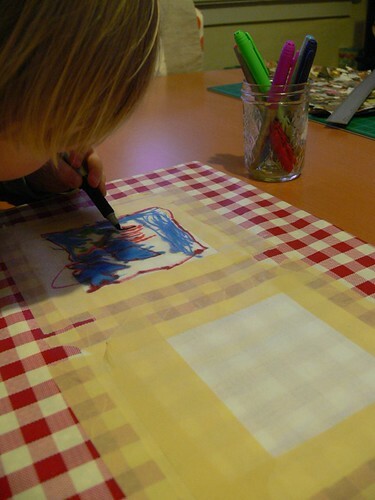 The first step was getting him to draw some pictures on fabric. 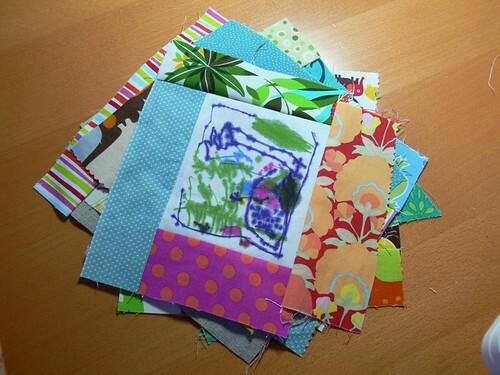 I started by taping some white cotton fabric scraps to a large piece of oil cloth-covered cardboard. My local fabric shop didn't have any fabric markers when I called but she suggested either trying one of the other fabric shops in town or using permanent markers -- which I could get at the drugstore that is walking distance from my house. We went with permanent markers (much easier than loading both kids in the car for a trip to a further fabric store!). Plus, permanent markers now come in a great array of colors! Ben had so much fun drawing these panels. A couple of them tell a very convoluted story (one is an under the sea adventure, the other one is a Christmas story), and others are more abstract (a part of a rainbow, a pink box). Drawing took a couple of days. 3-year-olds have the attention span of a flea. The day after that, I gave Ben my fabric scrap box and asked that he pick 4 pieces to frame each picture and 1 piece for the back of each mug rug. It was hilarious to listen to his commentary on the fabrics he recognized ("Dis one is from Henwy's burpcloth!" "Dis one is from dat thing on our dining woom table!") and to hear his very specific and opinionated choices for each mug rug ("Dis one will have polka dot", "Dis bee fabwic is great for the back of dis one" "Dis yooks POH-fect!"). Good times. While he was napping the other day, I sewed the scraps onto the drawings in a simple log-cabin fashion and squared them off as best as I could. Ben then helped me sew the layers together, flip them around and poke the corners with a chopstick (apparently a super cool trick!) 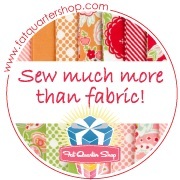 then sew them shut and quilt them with a couple of squares. 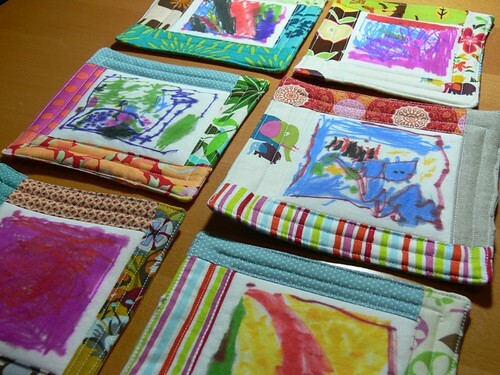 Needless to say, the stitching is quite a bit off-kilter on these little things but it adds to the kid-made charm! 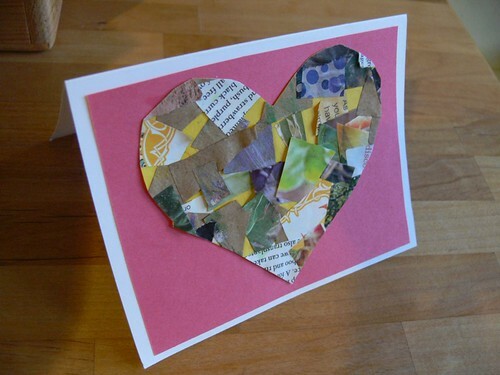 Now, I need to get to the post office and mail these off (along with our Valentine thank you cards, ahem). In the meantime, I am loving my own little mug rug! 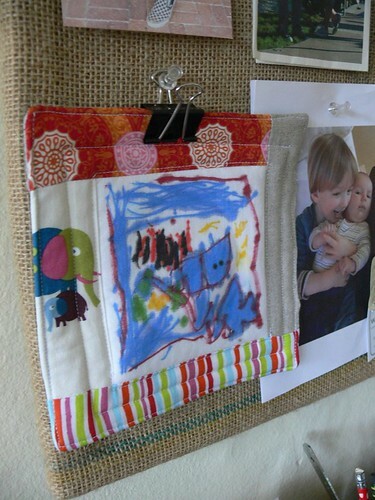 When it's not in use, I've found it makes great art on my bulletin board, hung with a clip. Jenny I love this project, especially how involved Ben was in the whole process! They really turned out great. Happy Valentine's Day!! 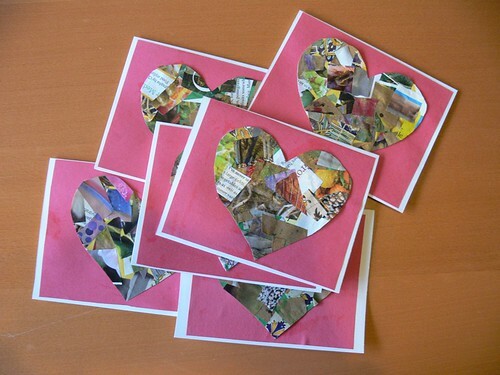 Unlike you, we didn't have to make a bunch of Valentine's cards for classmates this year. However, Ben still owed thank you cards to friends and family members for Christmas gifts (shameful, I know), so I finally decided to combine the two occasions: hearty Valentine-y thank you cards. We've had so many snowy and rainy days this winter that I've been jumping on any project that requires several steps to complete. This ends up keeping us busy for several mornings at home. 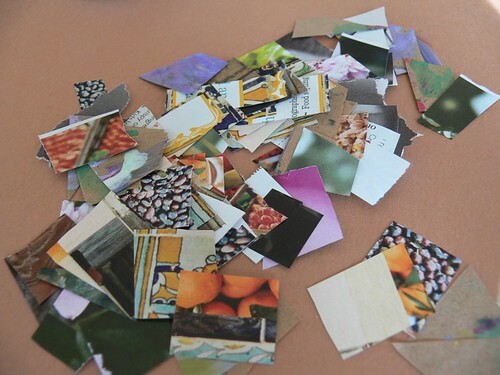 In this case, we decided to make collages to then use in making cards. 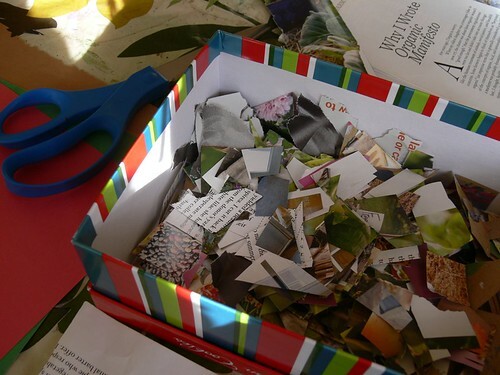 The first step was to cut a bunch of different papers into little bits. Fun! We used some of Ben's paintings that I'd saved up for months (years? ), as well as catalogs and magazines. 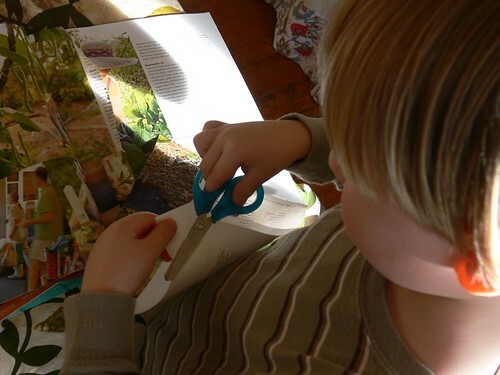 The best magazines for getting some good paper bits are gardening, food and travel magazines. You get so many fantastic textures in the images: flowers, beans, landscapes, maps, tiles, polka dots, etc. Once we had filled up our box (formerly housing fabulous almond shortbread snowmen cookies from Trader Joe's!) 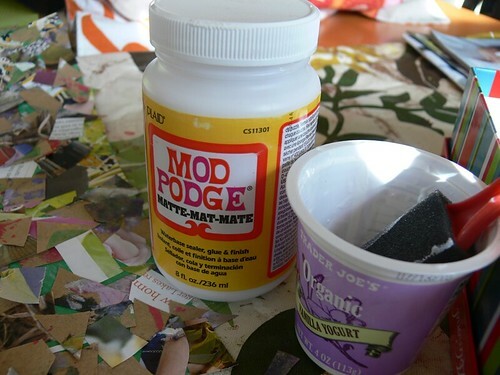 with a bunch of paper bits, we lathered some construction paper in Mod Podge and went to town covering it with these paper bits. 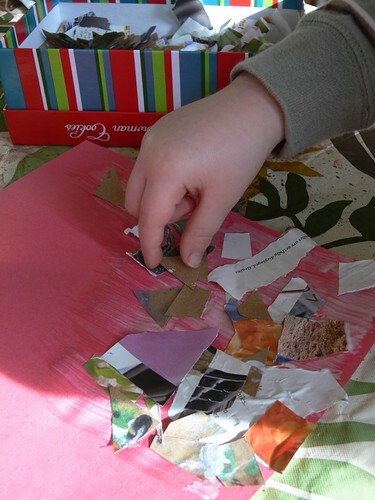 Once the first layer was dry, we went over it with Mod Podge to sort of secure all the paper bits into one solid layer. I love the look of these collages! 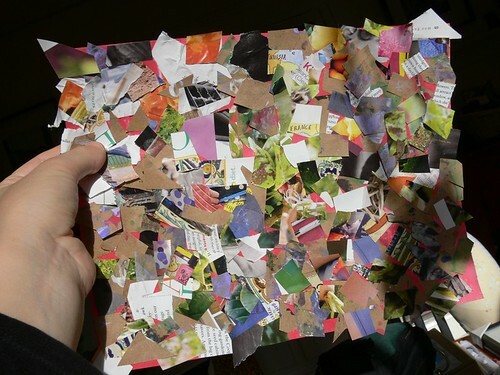 A few days later, I cut cardstock paper in half and folded those pieces in half to make cards. 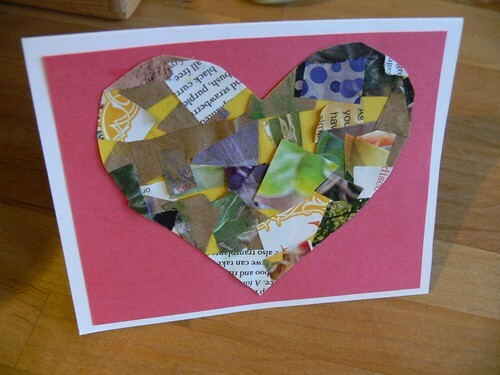 I cut hearts out of the collage sheets, and rectangles (slightly smaller than my cardstock cards) out of construction paper. 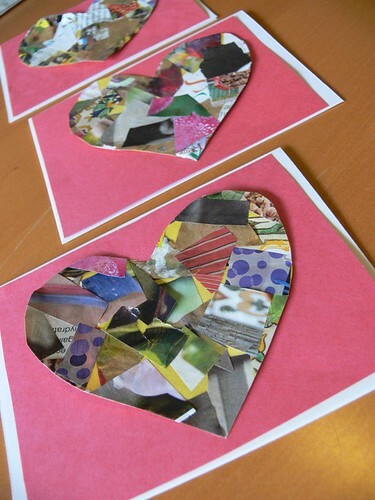 With Mod Podge, again, we pasted red rectangles and then hearts cut from the collage onto the cards. I apologize to our family and friends who will see these cards here before receiving them. I am on an alternate schedule called Baby-wakes-me-up-200-times-per-night-and-I-no-longer-know-which-day-it-is Time, and thus our cards will be late! 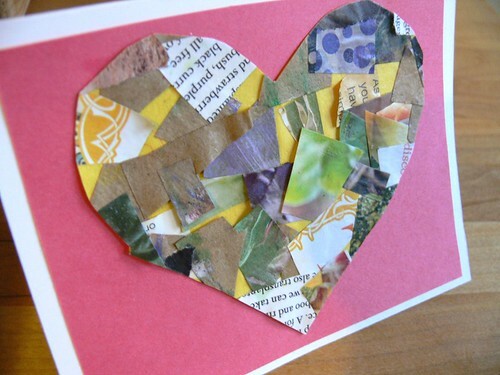 Jenny, what a creative way to use paper scraps! 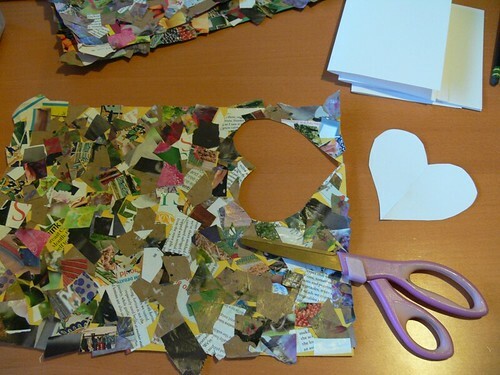 The collages look great, and it is so fun for 3 year olds to use scissors! I love the way the cards turned out. 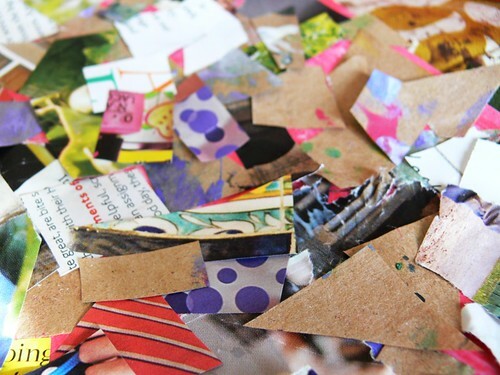 How do you organize all the paper scraps you collect? I get overwhelmed by the piles sometimes, and end up recycling it all instead. 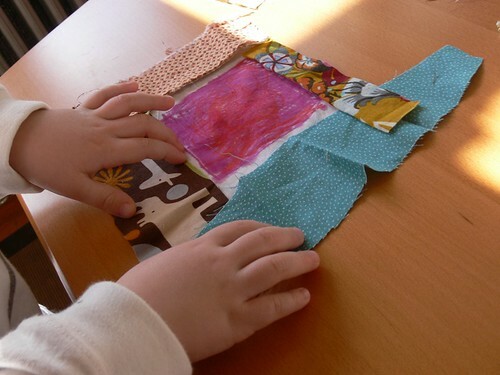 - Great idea for making a quilt out of a jelly roll by Rita at Red Pepper Quilts. 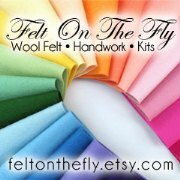 That Sherbet Pips fabric is so cute! 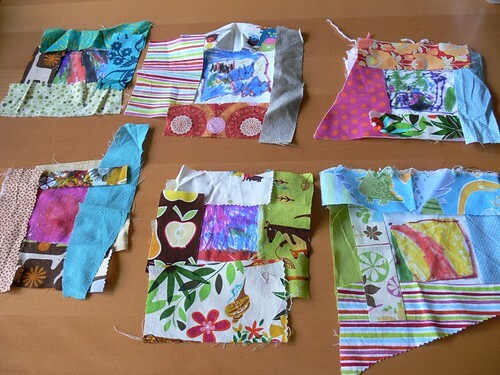 - Check out the finished Echino quilt top with improv blocks by Elizabeth at Oh Fransson! 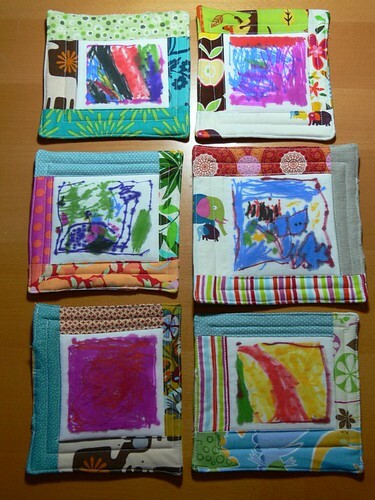 - Great stashbuster by Noodlehead: pillow cases! And that's about it! Enjoy, and have a lovely weekend (and Happy Valentine's Day if you celebrate it)!! Links: Button, button, who wants a button?